CEDAR CITY – Two suspects are in custody Thursday morning after a high speed chase and four-hour manhunt involving officers from six different law enforcement agencies and two K-9 units. Anthony Morris, 20, was arrested for one second-degree felony for possession of a stolen vehicle, two third-degree felonies for fugitive from justice and felony evading, two class B misdemeanors for property damage and reckless driving and a class C misdemeanor for excessive speed. Iron County Sheriff Mark Gower said information on the other suspect was not yet available as authorities are still processing him into the jail. After clocking a black 2011 GMC Acadia traveling south on Interstate 15 at 108 mph, Parowan City Police Sgt. 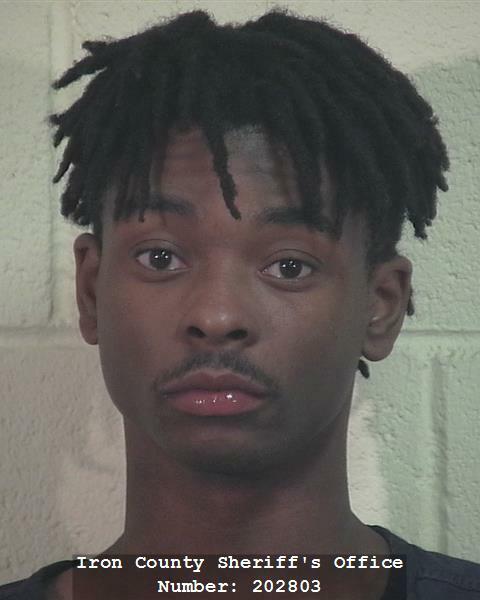 Paul Smith attempted to pull the vehicle over at milepost 75 but the driver refused to stop, continuing at a high rate of speed, said Parowan City Police Chief Ken Carpenter. As soon as the officer turned on his emergency lights the lights of the car being pursued were shut off, making it difficult for Smith to see the vehicle. “As soon as he (Smith) turned on all his emergency lights they turned all theirs off so they could try and flee. So it was a pursuit in the dark,” Carpenter said. Smith continued to pursue the vehicle and was soon joined by the Iron County Sheriff’s Office and Utah Highway Patrol. During the pursuit, which began just after 1 a.m., the suspects appeared to be pulling off to the shoulder of the freeway when they sped up again, this time almost out-distancing the officer, Carpenter said. “It looked like they were thinking about running. Paul thought they were going to try and bail out of the car,” he said. The chase continued southbound at speeds in excess of 100 mph to milepost 55, about two miles south of Cedar City, where UHP had deployed spikes, said Iron County Sheriff Deputy Sgt. Nik Johnson. It was another four miles before the car came to a stop, eventually hitting a Department of Transportation freeway exit sign, he said. A foot chase began as the suspects bailed from their vehicle and jumped over a fence in the Hamilton Fort area where there are no streetlights and very few homes. Police immediately began searching the property and a home located right next to the fence, Johnson said. “The lady who lived there was by herself so we immediately cleared her home, all of the out buildings and the property to make sure the suspects weren’t there,” Johnson said. A sheriff K-9 unit was dispatched to the area at around 1:30 a.m. About 30 minutes later, the dog found one of the suspects, who was bitten in the calf after he refused to follow police orders, Johnson said. Gold Cross Ambulance responded to the scene and treated the wound. The suspect was then released to a UHP trooper who transported him to the hospital for further examination. The Iron County Citizen Alert system called residents in the surrounding area at approximately 1:45 a.m. to let them know police were actively looking for the two fugitives. Jared Andersen, a homeowner in the area, said he did not receive the alert because he’s not signed up for the system but was woken up in the middle of the night by his neighbor calling to tell him about the situation. Andersen said there were several police cars driving around with their spotlights on throughout the night. He said he stayed awake until police left the area at around 4 a.m. The Cedar City Police Department also brought a K-9 unit to the scene later in the search. Police continued combing the area for the next two hours looking for the second suspect. Finally at around 4 a.m. someone notified dispatch of a hitchhiker on I-15 at milepost 49, just a few miles down the road from where authorities were searching. The suspect was taken into custody without incident, Johnson said, and transported to the Iron County Correctional Facility. A check on the vehicle license plate revealed it had been reported stolen in Wisconsin. Several law enforcement agencies assisted in this incident including the Enoch City Police Department, Cedar City Police Department, Parowan City Police Department, Southern Utah University and the Iron County Sheriff’s Office. I bet dot boy will have something to say about that criminal Mr. Anderson stating he had a gun. There’s no reason to think of those two fine upstanding citizens as a threat at 2 am! Just sit at home and when they break in, calmly call the police and wait for their response. Surely you can hold out for 5-7 minutes while someone responds. Something tells me they were lucky the local authorities found these idiots before some of the local populace found them. Now you just sound like a bigot. The gun-toting domestic terrorists around here wouldn’t go out looking for diversity at 2 am- diversity would find them at 2 am! That dude looks like the leader of #BLACKLIVESMATTER. You know, that bunch that advocate for non-blacks (aka: white people) to die. I would seriously recommend letting them know they are in the wrong place…..unless they were on their way to SLC to try to meet with the leaders of the LDS organization to support their cause. Cedar City is pretty remote, so I’m guessing that response time would be a lot longer than 5-7 minutes. More like 25-60. No way. The anti-gun crowd is always touting how police can protect us and their response is “only minutes” away. Even dot boy is sure that there is no reason to have the means to defend yourself. Only a domestic terrorist would rely on his own means of home defense. Notice how anything the RealMcStupid posts is always the same old rhetoric .blah blah this and blah blah that. and your a bigot this and your a bigot that. It seems living in his mommies basement has somewhat limited his knowledge of the REAL world. …put down your pacifier boy and step out into reality ! Notice how anything the dot boy posts is always the same old rhetoric .blah blah this and blah blah that. and you’re a bigot this and you’re a bigot that. It seems living in his mommies basement has somewhat limited his knowledge of the REAL world. …put down your pacifier boy and step out into reality !